!!! 2 OWNERS, LOW MILES 117K MILES, VERY WELL MAINTAINED, GEORGIA CAR SINCE NEW, NEW TIRES, NEW WHEEL HUBS & SPEED SENSORS, NEW OXYGON SENSORS, NEW BATTERY, CLEAN TITLE, CURRENT EMISSIONS!!! 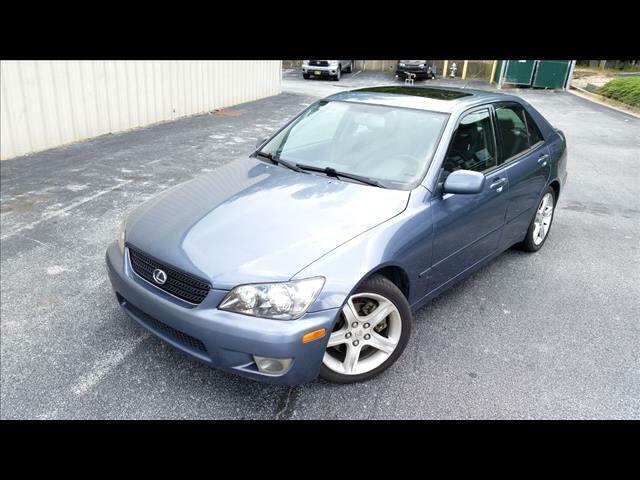 Selling this VERY well maintained LOW MILES, 2 OWNER, 2004 Lexus IS 300. Lots of new parts as listed above. It doesn't need anything at all and drives very smooth. Factory upgrade JBL Audio. The engine is strong and silky smooth. No leak or any funny noises. Transmission shift perfectly. AC Blows Cold/Heat works great. The exterior is good condition. Non smoker interior, no rips, no tears. It comes equipped with like new and brakes have plenty of life left on them. All the features work on it as they should. As these vehicles are getting older they are becoming harder to find this well kept up and unmodified. Buy with confidence as it comes with CarFax Buy Back Guarantee, and just had major services just done. This is a No Haggle CASH sale price. !!! !PLEASE CALL TO SET UP AN APPOINTMENT TO VIEW THE VEHICLE. TRADE IN & ALL MAJOR CREDIT CARDS ACCEPTED!! Message: Thought you might be interested in this 2004 Lexus IS 300.